It is ironic then, that much of the vision for exploiting renewable energy relies on expanding power systems. In fact it involves greatly increasing their interconnectedness and complexity in the process, for instance through the use of 'smart grid' technologies, in order to compensate for the problems of intermittency and non-dispatchability. These difficulties are frequently dismissed as inconsequential in the envisioned future context of super grids and smart grids. The goal of modern power systems is to balance supply and demand in real time over a whole AC grid, which is effectively a single enormous machine operating in synchrony. North America, for instance, is served by only four grids - the east, the west, Texas and Quebec. System operators, who have little or no control over demand, rely on being able to control sources of supply in order to achieve the necessary balance and maintain the stability of the system. Power systems have been designed on a central station model, with large-scale generation in relatively few places and large flows of power carried over long distances to where demand is located, via transmission and distribution networks. Generation must come on and off at the instruction of system operators. Plants that run continuously provide baseload, while other plants run only when demand is higher, and some run only at relatively rare demand peaks. There must always be excess capacity available to come on at a moment's notice to cover eventualities. Flexibility varies between forms of generation, with inflexible plants (like nuclear) better suited to baseload and more flexible ones (like open-cycle gas plants) to load-following. The temptation when attempting to fit renewables into the central station model is to develop them on a scale as similar as possible to that of traditional generating stations, connecting relatively few large installations, in particularly well-endowed locations, with distant demand via high voltage transmission. Renewables are ideally smaller-scale and distributed - not a good match for a central station model designed for one-way power flow from a few producers to many consumers. Grid-connected distributed generation involves effectively running power 'backwards' along low-voltage lines, in a way which often maximizes power losses (because low voltage means high current, and losses are proportional to the square of the current). This is really an abuse of the true potential of renewable power, which is to provide small-scale, distributed supply directly adjacent to demand, as negative load. Minimizing the infrastructure requirement maximizes the EROEI, which is extremely important for low EROEI energy sources. It would also minimize the grid-management headache renewable energy wheeled around the grid can give power system operators. Nevertheless, most plans for renewable build-out are very infrastructure-heavy, and therefore energy and capital intensive to create. Both wind and solar are only available intermittently, and when that will be is only probabilistically predictable. They are not dispatchable by system operators. Neither matches the existing load profile in most places particularly well. Other generation, or energy storage, must compensate for intermittency and non-dispatchability with the flexibility necessary to balance supply and demand. Hence, for a renewables-heavy power system to meet demand peaks, either expensive excess capacity (which may stand idle for much of the time) or expensive energy storage would generally be required. To some extent, extensive reliance on power wheeling, in order to allow one region to compensate for another, can help, but this is a substantial grid management challenge. Little storage currently exists in most places, although in locations where hydro is plentiful, it can easily serve the purpose. Where there is little storage potential, relatively inflexible existing plants may be required to load-follow, which would involve cycling them up and down with the vagaries of intermittent generation. This would greatly reduce their efficiency, and that of the system as a whole, reducing, or even eliminating, the energy saving providable by the intermittent renewables. Not all renewables are intermittent of course. Biomass and biogas can be dispatchable, and can play a very useful role at an appropriate scale. EROEI will be relatively low given the added complexity and energy input requirement of transporting and/or processing fuel, and also installing, maintaining and replacing equipment such as engines. Biogas is best viewed as a means to prevent high energy through-put by reclaiming energy from high-energy waste streams, rather than as a primary energy source. This will be useful for as long as high energy waste streams continue to exist, but as these are characteristic of our energy-wasteful fossil fuel society, they cannot be expected to be plentiful in an energy-constrained future. The alternative - feeding anaerobic digesters with energy crops - is heavily dependent on very energy intensive industrial agriculture, which translates into a very low EROEI, and will not be possible in an energy-limited future scenario. Smart grid technology, large and small scale energy storage, smart metering with time-of-day pricing for load-shifting, metering feedback for consumption control (active instead of passive consumption), demand-based techniques such as interruptible supply, and demand management programmes with incentives to change consumption behaviour could all facilitate the power system supply/demand balancing act. This would be much more complicated than traditional grid management as it would involve many more simultaneously variable quantities of all scales, on both the supply and demand sides, only some of which are controllable. It would require time and money, both in large quantities, and also a change of mindset towards the acceptability of interruptible power supply. The latter is likely to be required in any case. Greater complexity implies greater risk of outages, and potentially more substantial impact of outages as well, as one would expect structural dependency on power to increase enormously under a smart-grid scenario. If many more of society's functions were to be subsumed into the electrical system - transport (like electric cars) for instance - as the techno-utopian model presumes, then dependency could not help but be far more deeply entrenched. In this direction lie even larger technology traps than we have already created. In Europe, where indigenous fossil fuel sources are largely depleted, there has been a concerted move into renewables in a number of countries, notably Germany and Spain, since the 1990s. The justification is generally climate change, but security of supply plays a significant role. Avoiding energy dependence on Russia, and other potentially unstable or unreliable suppliers, by developing whatever domestic energy resources may exist, is an attractive prospect. Public policy has directed large subsidies into the renewable energy sector in the intervening years. Feed-in tariffs, offering premium prices for renewable power put on to the grid, were introduced, with different tariffs offered for different technologies and different project sizes, in order to incentivize construction and grid connection of all sources and sizes of renewable power. In addition, in a number of jurisdictions, grid access processes have been streamlined for renewables, and renewable power has preferential access to the grid when the intermittent energy source is available. Other power sources can be constrained off if insufficient grid capacity is available. …In a first blueprint for the government, the companies proposed 2,100km of direct-current power lines - similar to those used for undersea links like that between the U.K. to the European continent - to connect the North Sea and the Baltic coasts to the south. On top of that, 1,700km of traditional alternating-current lines would have to be built, they said. These would complement 1,400km of this type of line already planned or being built - at a cost of €7-billion - under the government’s decade-old network plan. Since Ms. Merkel closed eight of the country’s 17 nuclear reactors last summer and brought forward the phase-out of the energy source to 2022 from 2036, her biggest headache has proved the stability of the electricity network, which was designed to pipe nuclear electricity from south to north, not renewable electricity from the coast. 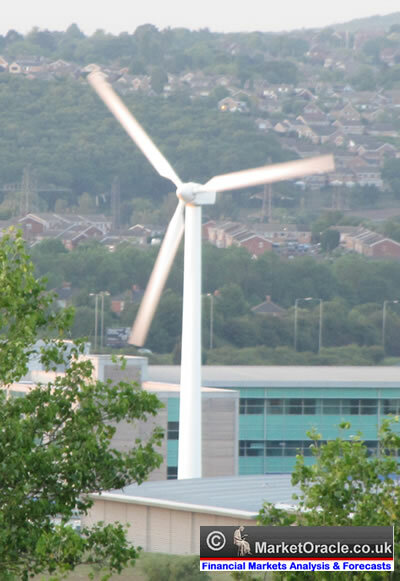 The generation of electricity from wind is usually a completely odorless affair. After all, the avoidance of emissions is one of the unique charms of this particular energy source. But when work is completed on the Nordsee Ost wind farm, some 30 kilometers (19 miles) north of the island of Helgoland in the North Sea, the sea air will be filled with a strong smell of fumes: diesel fumes. The reason is as simple as it is surprising. The wind farm operator, German utility RWE, has to keep the sensitive equipment -- the drives, hubs and rotor blades -- in constant motion, and for now that requires diesel-powered generators. Because although the wind farm will soon be ready to generate electricity, it won't be able to start doing so because of a lack of infrastructure to transport the electricity to the mainland and feed it into the grid. The necessary connections and cabling won't be ready on time and the delay could last up to a year. In other words, before Germany can launch itself into the renewable energy era Environment Minister Norbert Röttgen so frequently hails, the country must first burn massive amounts of fossil fuels out in the middle of the North Sea -- a paradox as the country embarks on its energy revolution. What started out as a bit of a joke - last December Der Spiegel noted how RWE's Nordsee Ost wind farm, far from delivering clean energy, was burning diesel to keep its turbines in working order - has rapidly turned serious. Siemens, the contractor for Germany's offshore transformer stations, has booked almost €500 million in charges, according to Dow Jones. RWE is set to lose more than €100 million at Nordsee Ost. And E.ON's head of Climate and Renewables, Mike Winkel, is on record as saying that no one, at E.ON or anywhere else, will be investing if the network connection is uncertain. …Grid operators and their suppliers in Germany underestimated the challenges of connecting projects, Hermann Albers, head of the BWE wind-energy lobby, said in an interview earlier this year. Albers expects Germany won’t reach its 10- gigawatt goal by 2020, installing not more than 6 gigawatts by then. Shares of Vestas, the world’s biggest wind turbine maker, have fallen 80 percent in the past year, underperforming the 56 percent decline in the Bloomberg Industries Wind Turbine Pure- Play Index (BIWINDP) tracking 14 companies in the industry. Siemens, which with Vestas dominates the offshore business, dropped 27 percent over the same period. The draft bill endorsed by Chancellor Angela Merkel’s Cabinet of Ministers would make power consumers pay as much as 0.25 euro cents a kilowatt-hour if wind farm owners can’t sell their electricity because of delays in connecting turbines to the grid. The plan is aimed at raising investments after utilities threatened to halt projects and grid operators struggled to raise financing and complete projects on time. Germany's status as a global leader in clean energy technology has often been attributed to the population's willingness to pay a surcharge on power bills. But now that surcharge for renewable energy is to rise to 5.5 cents per kilowatt hour (kWh) in 2013 from 3.6 in 2012. For an average three-person household using 3,500 kWh a year, the 47 percent increase amounts to an extra €185 on the annual electricity bill. "For many households, the increased surcharge is affordable," energy expert Claudia Kemfert from the German Institute for Economic Research told AFP. "But the costs should not be carried solely by private households." Experts have pointed out that with many energy-intensive major industries either exempt from the tax or paying a reduced rate, the costs of the energy revolution are unfairly distributed. Meanwhile, the German Federal Association of Renewable Energies (BEE) maintains that not even half the surcharge goes into subsidies for green energy. "The rest is plowed into industry, compensating for falling prices on the stock markets and low revenue from the surcharge this year," BEE President Dietmar Schütz told the influential weekly newspaper Die Zeit. Grid instability is of increasing concern in Germany as a result of the rapid shift in the type and location of power generated. The closure of nuclear plants in the south combined with the addition of wind power in the north has aggravated north-south transmission constraints, which are only marginally mitigated by photovoltaic installations in Bavaria. With a steep growth of power generation from photovoltaic (PV) and wind power and with 8 GW base load capacity suddenly taken out of service the situation in Germany has developed into a nightmare for system operators. The peak demand in Germany is about 80 GW. The variations of wind and PV generation create situations which require long distance transport of huge amounts of power. The grid capacity is far from sufficient for these transports. As the German grid is effectively the backbone of the European grid, and faults can propagate very quickly, instability is not merely a German problem. Instability can result from a combination of factors, including electricity imports and exports and the availability of fuel for conventional generation. Germany narrowly avoided, causing an international problem in February 2012 due to power flows between Germany and France and a shortage of fuel for gas-fired generation in southern Germany. Many new coal and gas-fired plants are to be built in the south in order to address the problem. Old coal plants are likely to have their lives extended and emission limits loosened in order to maintain needed generation capacity. Thermal plants are being effectively forced to operate uneconomically, as they must ramp up and down in order to make way for the renewable power that has priority access to the grid. Operating in this manner consumes additional fuel and produces accelerated wear and tear on equipment. Price volatility is increased, making management decision much more difficult. On days when there is a lot of wind, the sun is shining and consumption is low, market prices on the power exchange can sometimes drop to zero. There is even such a thing as negative costs, when, for example, Austrian pumped-storage hydroelectric plants are paid to take the excess electricity from Germany…. ….Germany unfortunately doesn't have enough storage capacity to offset the fluctuation. And, ironically, the energy turnaround has made it very difficult to operate storage plants at a profit -- a predicament similar to that faced by conventional power plants. In the past, storage plant operators used electricity purchased at low nighttime rates to pump water into their reservoirs. At noon, when the price of electricity was high, they released the water to run their turbine. It was a profitable business. Workers had to free half-finished aluminum rolls from the machines, and several hours passed before they could be restarted. The damage to the machines cost some €10,000 ($12,300). In the following three weeks, the voltage weakened at the Hamburg factory two more times, each time for a fraction of second. Since the machines were on a production break both times, there was no damage. Still, the company invested €150,000 to set up its own emergency power supply, using batteries, to protect itself from future damages…. ….A survey of members of the Association of German Industrial Energy Companies (VIK) revealed that the number of short interruptions to the German electricity grid has grown by 29 percent in the past three years. Over the same time period, the number of service failures has grown 31 percent, and almost half of those failures have led to production stoppages. Damages have ranged between €10,000 and hundreds of thousands of euros, according to company information. Producers of batteries and other emergency energy sources are benefiting most from the disruptions. "Our sales are already 13 percent above where they were last year," said Manfred Rieks, the head of Jovyatlas, which specializes in industrial energy systems. Sales at APC, one of the world's leading makers of emergency power technologies, have grown 10 percent a year over the last three years. "Every company -- from small businesses to companies listed on the DAX -- are buying one from us," said Michael Schumacher, APC's lead systems engineer, referring to Germany's blue chip stock index…. ….Although the moves being made by companies are helpful, they don't solve all the problems. It's still unclear who is liable when emergency measures fail. So far, grid operators have only been required to shoulder up to €5,000 of related company losses. Hydro Aluminum is demanding that its grid operator pay for incidents in excess of that amount. "The damages have already reached such a magnitude that we won't be able to bear them in the long term," the company says. Given the circumstances, Hydro Aluminum is asking the Federal Network Agency, whose responsibilities include regulating the electricity market, to set up a clearing house to mediate conflicts between companies and grid operators. Like a court, it would decide whether the company or the grid operator is financially liable for material damages and production losses. For companies like Hydro Aluminium, though, that process will probably take too long. It would just be too expensive for the company to build stand-alone emergency power supplies for all of its nine production sites in Germany, and its losses will be immense if a solution to the liability question cannot be found soon. "In the long run, if we can't guarantee a stable grid, companies will leave (Germany)," says Pfeiffer, the CDU energy expert. "As a center of industry, we can't afford that." The expectation of uninterruptible power, and the extreme dependency it creates, is the problem. Consumers do not feel they should be required to provide resilience with expensive back up options, yet this is increasingly likely in many, if not most, jurisdictions in the coming years. 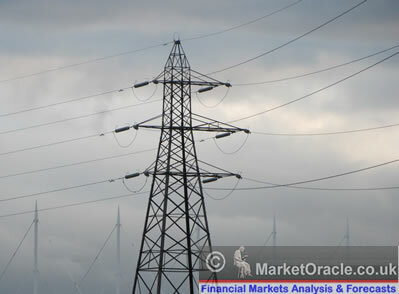 In emerging markets, it is common for power supply to be intermittent, and for fall-back arrangements to be necessary. We recently covered this situation in detail at The Automatic Earth, using India as a case study. The UK's Renewable Energy Roadmap has plans on a similar scale to Germany, proposing 18GW of wind capacity by 2020 (or some 30,000 turbines). Scotland is particularly keen to emulate, and surpass, Denmark, which generates 30% of its power from wind. Denmark is able to do this because it does not operate in isolation. It is effectively twinned with with Scandinavian hydro power, which provides the energy storage component, albeit at a price. On windy days, Denmark can export its surplus power to its neighbours, which have large enough grids to absorb power surges, but it does so at a low price. When the wind is not blowing, Denmark imports power at a high price. Ownership of the storage component makes a significant difference to the economics. Unfortunately for Scotland, it currently has no access to a comparable hydro resource, either within it own borders or in the English market where it would be selling surplus power. As things stand, if wind power were developed at the proposed scale, it would have to be twinned with gas plants, but North Sea gas is already in sharp decline. For this reason, Britain and Scandinavia are planning to build NorthConnect, which would join Britain and Norway in the world's longest subsea interconnector (900km) at an estimated cost of £1 billion (€1.3 billion), supposedly by 2020. This would follow on from the BritNed interconnector linking Britain and the Netherlands as of 2011 - a 260km line developed at a cost of £500 million (US $807.9 million). "Using state-of-the-art technology, the interconnector will give the UK the fast response we will need to help support the management of intermittent wind energy with clean hydro power from Norway," Steven Holliday of the National Grid says. "It would also enable us to export renewable energy when we are in surplus. At this very moment a seabed survey is underway in the North Sea, looking at the best way to design and install the cable, which would run through very deep water." If the project were completed as projected, it would allow the British, like the Danes, to subsidize the Norwegian power system, as the economic advantage lies with the owner of the storage capacity. The odds of completing such an ambitious project on time, however, and within budget, have to be regarded as low even if we were not facing financial crisis. Given that we are, those odds fall precipitously. The likelihood of having to twin whatever off shore wind is actually built with gas therefore increases. UK gas production is falling and storage is limited. The shale gas reserves touted to provide affordable gas in the future amount to a mirage, thanks to the very low EROEI and high capital requirement. The UK is facing a future as a gas importer at the wrong end of a long pipeline from Russia. This is not a secure position to be in, especially given the UK's gas dependence following the 1990s dash for gas. Developing wind power will make little difference if there is no flexible generating plant to provide back up. The cost of building the turbines, their grid connections, back up gas plants and additional gas storage would be over ten times the amount required to build a fossil fuel alternative. According to a recent report to Britain's Department of Energy and Climate Change, the cost of the grid connection alone would be greater than the entire cost o the alternative option. When introducing a discount rate of 5%, which can be considered very low both in non-financial and in financial realms, and represents societies with high expectations for long-term stability (such as most OECD countries), the EROI of 19.2 of this particular temporal shape of future inputs and outputs is reduced to and 'effective' EROI of 12.4 after discounting. But discount rates are not the same in all situations and societal circumstances. Investing into the same wind power plant in a relatively unstable environment, for example in an emerging economy, where discount rates of 15% are more likely, total EROI for this technology is reduced to a very low value of 6.4, nearly 1/3 of the original non-discounted value. Currently stable states are far more likely to resemble developing countries in a future of upheaval. The investment choice is having to be made at a time when financial crisis is beginning to bite, thanks to Britain's disastrous financial position as the ponzi fraud capital of the world. While wind is currently the preferred option, it is very likely the decision will be revised over the next few years, with relatively few turbines ever having been built, and perhaps even fewer actually connected to the grid. Neither the turbines nor the gas alternative, if there turns out to be sufficient capital to build either one, would last more than perhaps thirty years, so both represent medium term solutions only. The CEO of the National Grid, in an interview last year with the Today Programme on BBC Radio 4, informed listeners that they would have to get used to intermittent power supply. No one seemed to be paying attention. It is interesting to note that under the old nationalized and vertically integrated CEGB in Britain, there was a responsibility to keep the lights on. When the CEGB was broken up, the National Grid inherited only the responsibility to balance supply and demand. Millions of households are at risk of power black-outs within three years because coal stations are being replaced with wind farms, the energy watchdog has said. In its strongest ever warning, Ofgem said there may have to be "controlled disconnections" of homes and businesses in the middle of this decade because Britain has not done enough to make sure it has enough electricity. The regulator's new analysis reveals the risk of power-cuts is almost 50 per cent in 2015 if a very cold winter causes high demand for electricity. Ofgem believes the lack of spare power generation "could lead to higher bills", which are already at record high of £1,300 per year. Whitehall sources said there is very little the Government can now do to avoid the risk of black-outs in the middle of the decade. It will take around three or four years to build any new gas plants and it would be very difficult to build more coal plants under European rules. Alistair Buchanan, chief executive of Ofgem, said Britain's energy system is struggling under the pressure of the "unprecedented challenges" of a global financial crisis, tough environmental targets and the closure of ageing power stations. Currently, Britain has 14 per cent more power plant capacity than is strictly necessary to keep the lights on. However, this crucial buffer will fall to just four per cent by the middle of the decade. Its report shows the risk of power-cuts begins to increase sharply from next year onwards. Given the time scale for changes in generation and in infrastructure, preparations based on joined-up thinking have to be made well in advance of any looming crunch points. We are essentially experimenting with changes in a sporadic and haphazard fashion, and finding we are running risks we had not anticipated due to our failure to understand infrastructure requirements and dependencies. The risks are building rapidly, and it may already be too late to avoid unpleasant consequences. Essentially, what appears to be happening across Europe is that nations are falling in love with offshore wind, permitting grand projects far out to sea - and then belatedly realizing that it is not so easy to get the energy back to shore. It is a bit like building hotels in the desert and forgetting to put the roads in. How come some of the world's most advanced and industrialized countries are committing such a colossal oversight? The problem is one of mindset. Ever since the first days of electricity, there has really only been one model for energy distribution. You build a generating center, more or less wherever you want it, and then create outbound distribution links to whoever needs power. This hub-and-spoke model is deeply ingrained in every aspect of energy distribution, from how utilities and grid operators work to the way regulators and policy makers think. But for renewable energy, it does not work. You cannot just put a wind farm wherever you want. In fact, in the case of offshore wind, the locations you have could hardly be more inconvenient from an energy transport point of view. That means grid connections almost need to come first in the thinking about offshore wind. How expensive will they be? How feasible? How can the costs and installation timeframes be reduced? These questions are fairly obvious, and are nothing new. One renewable energy veteran remembers speaking to an oil and gas representative a few years ago, who said that if we were really serious about renewables then the first thing we would have to change is the grid. Needless to say, that has not happened. If the issue is not addressed soon then every offshore market runs the risk of having an experience like Germany's. A European supergrid, with many cross-border transmission lines, has long been a European goal. The idea is to share power as widely as possible, evening out disparities in supply and demand across Europe. It is intended to be particularly applicable in terms of evening out the effects of intermittent renewable energy, notably off-shore wind, which could be linked with distant storage capacity. The vision even includes integrating Icelandic geothermal power. The North Sea Grid Initiative consists of Germany, Denmark, Norway, Sweden, Belgium, France, Luxembourg, and the United Kingdom. These countries signed a memorandum of understanding back in 2011 to help spur offshore wind development and tap into the ideal types of renewable energy in different parts of Europe within the next decade. More than 100 gigawatts (GW) of offshore wind are in the development or planning phases throughout Europe. Pooling grid connection costs between countries by linking wind farms is projected to bring costs down substantially. Interconnectors are extremely expensive, hence the incentive to reduce costs wherever possible. To make offshore wind work in northwest Europe, policymakers may have to adopt even more ambitious plans for the technology, gathering individual projects into hubs further offshore to capture more wind and pool connection costs, in a potentially high risk strategy. The approach could shave 17 percent off an estimated 83 billion euros to connect 126,000 MW of offshore wind by 2030, according to a report produced last year by renewable energy lobby groups, consultancies and university research departments, "OffshoreGrid: Offshore Electricity Infrastructure in Europe". "Supergrid" is the future electricity system that will enable Europe to undertake a once-off transition to sustainability. The concept of Supergrid was first launched a decade ago and it is defined as "a pan-European transmission network facilitating the integration of large-scale renewable energy and the balancing and transportation of electricity, with the aim of improving the European market". Supergrid is not an extension of existing or planned point to point HVDC interconnectors between particular EU states. Even the aggregation of these schemes will not provide the network that will be needed to carry marine renewable power generated in our Northern seas to the load centres of central Europe. Supergrid is a new idea. Unlike point to point connections, Supergrid will involve the creation of "Supernodes" to collect, integrate and route the renewable energy to the best available markets. Supergrid is a trading tool which will enhance the security of supply of all the countries of the EU. Pension funds, while they still exist in their current form, could be lured into backing something too good to be true, as happened so extensively during the initial phase of the credit crunch. Such investments are highly unlikely to pay off. There will be an increase in gas-price volatility across Europe as markets with more wind capacity, such as the U.K., Spain, France, Germany and the Netherlands, are linked to those with less, James Cox and Martin Winter, consultants at Poyry in Oxford, England, said in a research report published today. Wind will be the main source of irregular supply, as output can still fall to zero no matter how much capacity is installed, while solar continues to produce even under cloud cover. "If it’s cold and still, it’s much more extreme for the gas network because you get the heating demand response to the cold weather and the power response to the still weather," Cox. The European Union has reached 100 gigawatts of installed wind-energy capacity, equivalent to the output of 62 coal-fired power stations, the European Wind Energy Association said Sept. 27. In the EU, about 5 percent of electricity came from wind last year. The winners in this scenario will be owners of so-called fast-cycling gas storage, which can respond rapidly to falling wind generation, and traders who can take advantage of diverging prices at Europe’s trading hubs as weather patterns vary by geography, Cox said. Germany’s electricity grid came to the brink of blackout last week – not because of the cold, but because traders illegally manipulated the system. They tapped emergency supplies, saving money but putting the system at risk of collapse. Normal supply is maintained by the dealers acting as go-betweens for the industrial and domestic electricity consumers and the generators so that the latter know how much to supply. The Berliner Zeitung said the dealers were legally obliged to continually order enough electricity to cover what their customers need. But this was not done earlier this month, according to the regulator’s letter. Instead dealers sent estimates which were far too low, meaning the normal supply was almost completely exhausted. Several industry insiders told the Frankfurter Rundschau daily the tactic was deliberately adopted to maximise profits. The dealers systematically reduced the amount they ordered for their customers, avoiding the expensive supply and forcing the system to open up its emergency supply – the price for which is fixed at €100 a Megawatt hour. This is generally considered very expensive – but compared to what else was on offer at the time, it represented huge savings – yet put the entire electricity supply system on emergency footing for no reason.